The latest update of the iPhone, available for the last few days now, has some fun features. We went for more of the psychological angle and, following the advice of some Doris users in the forums, addressed the sense of satisfaction many people get when they tick off a task. Until this release iPhone users had to resync their task list to get rid of items that were checked off. This can be forced, by the way, either by hitting the History tab, or exiting and restarting the application. But now we’ve added a feature that takes advantage of the iPhone’s accelerometer, to clear your completed Todos simply shake the phone! We added the Mac “empty trashcan” sound to highlight the effect – try it out – quite addictive after a while. Also be sure to try our ‘Disable sync’ feature on the settings screen. With sync disabled the iPhone only attempts to sync with your online account when it’s in wifi mode. This makes startup times and responsiveness much faster when you’re out and about. 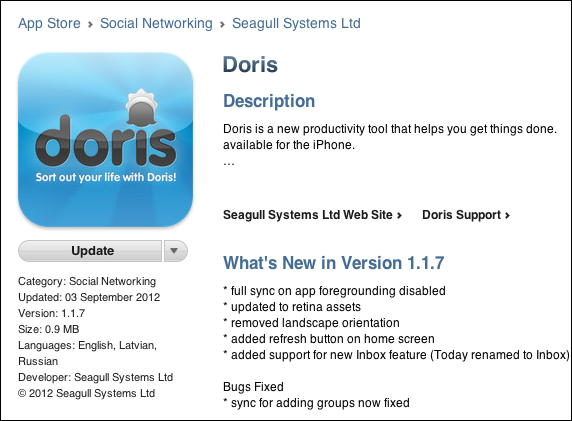 Where is the free iPhone version of Doris? We’ve had a bit of bad luck on this one, we actually submitted the free version to the AppStore over a month ago, but we’ve had 2 submissions rejected to date! It’s totally our fault, in our enthusiasm we didn’t read the AppStore terms and conditions carefully enough – we presented features in the interface that said things like “disabled for the LITE version” which is clearly disallowed. The other problem is that while app submissions and updates take the AppStore around 7 days to turn around, rejections are closed to 14! To end on a good note, our 3rd attempt at a free version of Doris was submitted Apr. 22nd so I estimate it will be available for general consumption by the end of this week. Great news: when it rains it pours! We’re feeling a little overwhelmed here at Doris HQ – seems everywhere we look we have great news! We’ve also been getting great feedback on Twitter and via email. And if that wasn’t enough, My High Street, another iPhone app we launched on Tuesday is already at position #17 #2 in the UK AppStore (Navigation) and is getting tons of downloads. 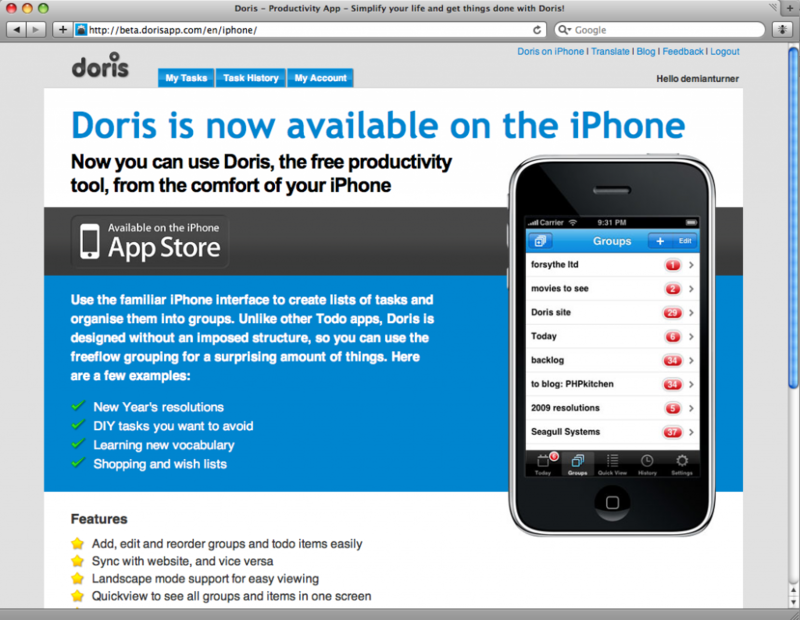 Thanks for all the the Doris buzz guys – keep it coming and let’s make her the best productivity app around! We improved the way data is sent to mobile devices (more announcements on this coming soon). This change takes effect immediately, all users of the iPhone app should notice that loading tasks and syncing work approximately twice as fast as before. NB: to see how many tasks you have total, go to the History screen and check what’s indicated for “Remaining uncompleted todos”, top right corner. So today Doris LITE was posted to the AppStore – it should be available for download in about 7 days. 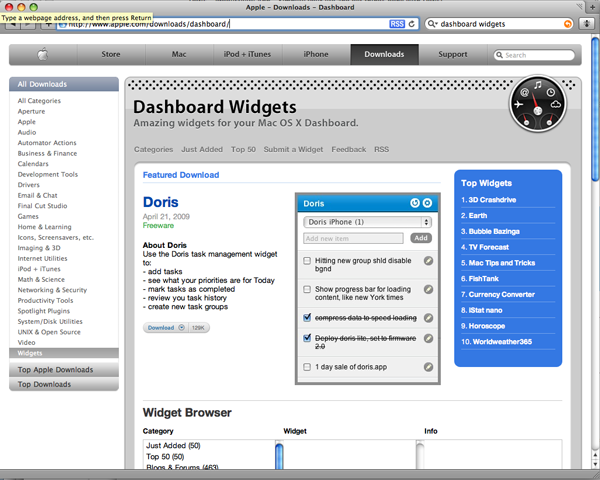 The app includes all the features of the regular Doris iPhone app with the exception that you can only sync with Doris on the web the first time you launch. So if you want to try out Doris LITE you are recommended to build up a decent selection of groups and items first in your web account. Then you can sync all the data to your iPhone, but only the first time you launch the app. After that all Doris LITE updates will not be updated in your web account. Unless of course you upgrade, which is a 1 click process. I’ll announce here when Doris LITE is available, stay tuned! After a somewhat lengthy wait we’re happy to announce Doris made it into the AppStore! We put together an iPhone page to give you all the details. The iPhone version of Doris gives you access to almost all the features offered by the website, with the addition of syncing – so you can keep on top of your tasks where ever you are. We will be releasing a lite version for the iPhone shortly that will have all the features of the regular version with the exception that it can only sync once per 24 hours. So you can try it out with no strings attached, then go for the full version if you like what you see. In the next version we’ll be bringing the full 11 languges of the website to the iPhone version, but for now it’s only localised in English, Latvian and Russian.